Essential thrombocythaemia (throm-bo-sigh-thee-me-a) is a condition that causes high platelets. It is quite a rare condition – only about 150 people in Christchurch have it. If you have this, you will be cared for both by your GP and by a hospital blood specialist (a haematologist). Most people with essential thrombocythaemia (ET) stay well, but they do have a higher risk of blood clots, because platelets are what make your blood clot. These can lead to deep vein thrombosis (DVT), pulmonary embolism, strokes, heart attacks, or loss of the blood supply to a toe or finger. 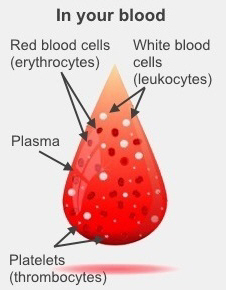 Sometimes, after many years people with ET can develop other blood problems, such as anaemia, scarring of their bone marrow (a condition called myelofibrosis), or even leukaemia. Generally, specialists suggest all ET patients take low-dose aspirin every day. Whether you would benefit from further treatment depends on your risk of getting a blood clot. have other conditions that increase your risk of blood clots, such as high blood pressure or diabetes. If you are in this highest-risk group, your doctors will suggest you have further treatment. don't have any other health conditions. If you are in this low-risk group, you probably won't benefit from treatment. If you are somewhere in between, your specialist will talk to you about the pros and cons of treatment. If I need treatment, what is it? If you need treatment it will be with hydroxyurea, which you will have received full information about. You will take a capsule of hydroxyurea every morning. It doesn't usually cause any side effects, but very rarely it might cause nausea (feeling sick). Hydroxyurea slows down your bone marrow so you don't make as many platelets. If you take too much, the number of red and white blood cells and platelets in your blood (called your blood count) will be too low. So you will need to get your blood count checked every couple of months or so, even if you've been taking the same dose for a while. Most people stay on the same dose of hydroxyurea for many years, perhaps needing only small changes. Occasionally people get skin reactions, particularly painful ulcers in their lower legs. If this happens to you, you will have to stop taking hydroxyurea and try another treatment. Hydroxyurea will make you more sensitive to the sun, so make sure you cover up and wear sunscreen if you go outside on sunny days. If you are generally well and on a stable dose of hydroxyurea, you will mostly see your own GP, which is much more convenient than coming into the hospital. Your GP will arrange to get your blood checked regularly, and will let you know if you need any changes in treatment. You will still need to see the hospital blood specialist every one to two years, to check how you are going. If anything new happens that worries you, talk to your GP or your blood specialist. If your GP is worried about anything they will ask your blood specialist for further advice. If this happens, you may need to see the hospital specialist earlier than usual.